Our parks are a gift. Maps of the United States are dotted green, marking our numerous state and national parks. These are places that offer refuge to plants and animals, even to that strangest of animals: the homo sapiens. The problem is, we take them for granted. For most of us, they've been around our entire lives. Shelters, trails, and nature centers, most built by the Civilian Conservation Corps (CCC) during the great depression, have appeared to age reasonably well, and we incorrectly assume they'll be around forever and need minimal upkeep. So in our misguided and seemingly insatiable appetite to pay fewer taxes and cut government spending, we look at these parks as a luxury, rather than a necessity, and give their funding the axe. That's a problem. Our state and national parks are not a luxury. They are one of the strongest threads in the tapestry that is our national identity. They protect invaluable natural resources. They allow us, disconnected as we are from nature, to commune with it, if only on weekends, vacations, or precious days-off. They protect endangered species, water, air, and life. They are unequivocally a necessity. They must be protected. They must have advocates, supporters, and champions. Enter the California State Park Champions. A program and a people dedicated to the preservation of the Golden State's cherished state parks. Those shelters, trails, and nature centers that seem to be timeless actually need constant upkeep. Incredibly well built as they are, in a perverse irony, without maintenance nature will take over and destroy them. This was work that used to be done by park employees. But with the severe funding cuts, there are fewer employees, and much less physical and financial resources for them. Rather than sit back and complain about how things used to be, hundreds of Californians spend a day each month making a difference. They grab shovels, picks, spades, clippers, paint brushes, and whatever else is needed, and head out to effect change. The program holds volunteer work days in various parks across the state. So, no matter where someone lives in California's 160,000 plus square miles, there's bound to be an opportunity within easy driving distance. To sweeten the offer, if you volunteer you get in the park for free and can camp for free. This perk is the impetus for sustaining and growing the program, as well as the friendships that result from the shared experience. We promised a bad photoshop job to Jason when he missed the group photo. We delivered. Tara and I were welcomed in by a jovial group that shares the ever strong bonds of altruism and camping. They share what some of them refer to as "family time" each month. They share laughs, food, and stories. Teachers, law enforcement personnel, military folks, IT people, and so many others from disparate walks of life share some time, breath in the fresh air, learn about each other, and in the process learn about themselves. All this in trade for a little labor that goes to instantly improving something they all cherish. 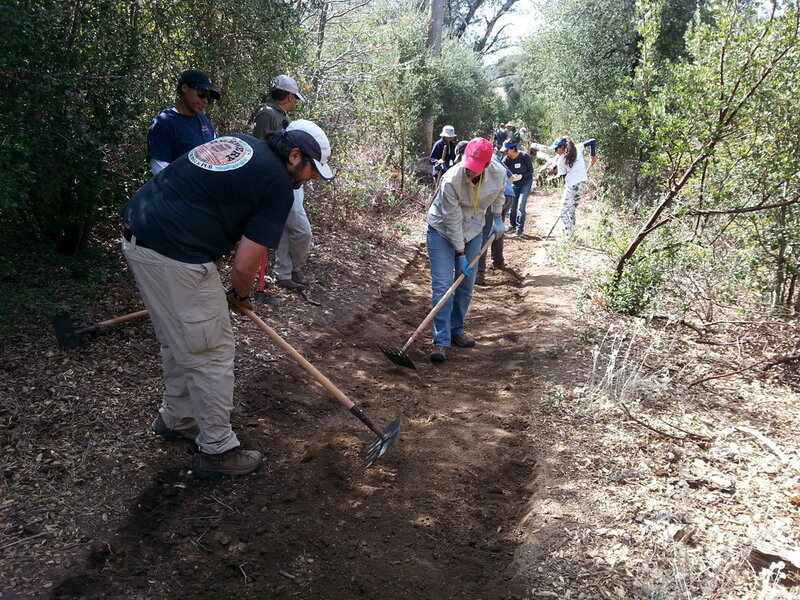 California is blazing a trail by improving one trail at a time. This program needs to spread to other states. It's essential for the parks and the people involved. So, why not see if something like this exists in your neck of the woods? If not, try starting one. This is what we need more of.